Are you looking for the best restaurant quality ranch dressing recipe? Our homemade Buttermilk Ranch Dressing is easy to make, tangy and herbaceous. When we spent a year in Uruguay, we discovered many of our staple condiments weren’t even a thing. One of the things we discovered wasn’t available was Buttermilk Ranch Dressing. I’d eaten ranch dressing on my salads since I was a kid, so I decided to learn to make buttermilk ranch dressing myself. It tastes immensely better, and this recipe is restaurant quality! You can make it up fresh when you want to use it. As long as you use fresh herbs, it’s ready to eat in an hour. 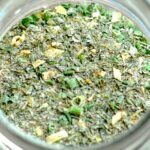 To substitute dried herbs, use 3 tablespoons of my homemade ranch seasoning blend. If you use dried herbs, it’s best to let it sit overnight so the dried herbs can fully re-hydrate. Want to make a ranch dip instead of ranch dressing? Simply swap the sour cream for buttermilk. It goes great with fresh veggies and chips. The Buttermilk Ranch Dressing will last in the refrigerator for as long as the earliest expiration date on the buttermilk or mayonnaise. So make sure to use the very freshest ingredients! Are you looking for the best restaurant quality ranch dressing recipe? Our homemade Buttermilk Ranch Dressing is easy to mix, healthy, tangy and herbaceous. Add all ingredients to a small mixing bowl, and whisk until well combined. Transfer to an airtight dressing container or pint sized mason jar. Refrigerate the Buttermilk Ranch Dressing for at least one hour before serving. If you use dried herbs, you should refrigerate it overnight. What’s your favorite way to use ranch dressing? This looks amazing. I love buttermilk ranch! I will have to try it. Sounds deliciously fresh – Thanks for sharing at the What’s for Dinner party! I love a good Ranch dressing, yours looks and sounds delicious. Can’t wait to try it. Thanks for sharing. My grandson loves ranch dressing. I’m going to Pin this recipe and make for him. Everything home made is always better. Thanks for sharing on Sunday’s Best. 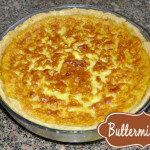 Buttermilk is wonderful in dressings and other recipes. Thanks for sharing with Fiesta Friday. Homemade Buttermilk Ranch has it all over bottled ranch! Thanks for sharing with Party in Your PJs! I pinned your dressing, it looks delicious! Hope you are having a great week and thanks so much for sharing your awesome post with us at Full Plate Thursday. Great share! Thanks for bringing your yummy homemade dressing to Fiesta Friday!